Michael McCarthy analyzed AT&T’s real estate portfolio for opportunities to use free air cooling. 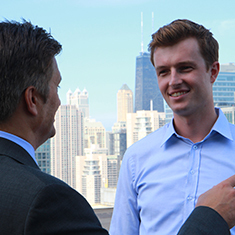 Michael McCarthy spent his summer as an EDF Climate Corps fellow with AT&T in Chicago, and was asked to analyze AT&T’s real estate portfolio for opportunities to reduce cooling demand. McCarthy visited facilities and reviewed utility bills, temperature data and surveys to identify potential improvements. McCarthy found that over 100 of AT&T’s largest buildings could optimize “free-air cooling,” a process that uses cool outside air to remove heat from data centers and other equipment spaces, allowing the air conditioning to be turned off. Free-air cooling can reduce a building’s total electricity consumption by over 20 percent and reduce the energy needed to cool a building by 20-50 percent over the course of a year. The free-air cooling measures that McCarthy identified require small upfront investments and pay back in less than two years. Video: AT&T discusses the efficiency opportunity in free-air cooling. Michael McCarthy, a student at Duke University, was hired as the 2011 EDF Climate Corps fellow at AT&T.